Denise plays football, though she is near sighted, and suddenly she gets a ball in her face, and her glasses break. She wakes up in hospital she is double sighted. Love is patient, love is kind... so do you love movie? Movie fans, if you are so fortunately and also unfortunately living in Hong Kong, I am very sure you're loving and hating the city at the same time. No paradox. The local movie distributors secure movies of all over the world, put them into quality DVD forms and sell them at very low price. Movie aficionados should be very happy to create a big library, yet the purchase may well flood the small living space very soon. 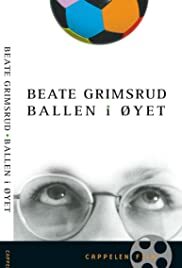 I came across the VCD of "Ballen i øyet" at a casual check. I don't know much about Norwegian movies and the shop was on big sale, so the story went like that. It's a come-of-age melodrama with something to tell. Denise plays soccer and a ball hits her in the eye. She wakes up in a ward with a surreal view of the world. Eye-bandaged, she only sees twins, pairs, couples and doubles. Gosh, she always has twins sisters. Is she the only one who's single? She realizes it's high time she gave up soccer and grew up. Yet, in what way? She keeps trying to grow up by taking up a simonizing job at the airport, and just like what is depicted in Plato's "Symposium", she is trying to track down her "half". She is learning and copying the others like many teenagers, and later finds that they are not wise though. Finally, she finds Erik. The story-telling may be awkward, clumsy and even pointless at times, the casting may be inappropriate, for instance, Laila Goody was already 29 when she did this project, no matter how much cosmetics they used, her more mature age still could not be hidden, not convincing as a teenager footballer at all, yet I give my smile to the art director and the camera-man because they have made effort to make everything look surreal and they did it pretty well. Furthermore, absolutely personal, I love the Chinese cameos/extras popping up even just for very short time. Even in bad movies, there are good elements for sure. Afterall, a big team has paid effort on it. Catrine Telle is a debutante in making movies, though she has long theatrical career as actress and director in Norway and Denmark stages and has also been a National Theatre Resident Director since 1995. A new genre means a new learning and learning takes time.